Gloria Jean’s Coffees has been working with the Rainforest Alliance since 2007 to offer one of the largest varieties of Rainforest Alliance Certified™ coffees available. Gloria Jean’s entire line of flavored coffees, both regular and decaf contains Rainforest Alliance Certified beans. That means that when you drink Gloria Jean’s flavored coffees you supporting a healthier planet, stronger forests and an improved quality of life for farming communities. Gloria Jean’s Coffees work with the Rainforest Alliance supports the shared goal of conserving ecosystems where coffees are grown and treating farm workers and their families with respect by helping ensure providing a decent wage, proper equipment and training, access to medical care, and education for the children of farm workers. The Rainforest Alliance, an international nonprofit, is focused on driving stronger forests and healthier communities, working to conserve biodiversity and ensure sustainable livelihoods by transforming land-use practices, business practices and consumer behavior. From large multinational corporations to small, community-based cooperatives, the Rainforest Alliance involves businesses and consumers worldwide in efforts to bring responsibly produced goods and services to a global marketplace. Throughout Latin America, Africa and Asia coffee beans are grown and harvested by some 25 million farmers, most of them smallholders, meaning small individual farms. The Rainforest Alliance works with these farmers to conserve natural resources and to protect forests, rivers and other wildlife habitats. Rainforest Alliance Certified farms meet the comprehensive third-party standard of the Sustainable Agriculture Network, which promotes environmental responsibility, social equity and economic viability for farm communities. The Rainforest Alliance Certified seal on Gloria Jean’s Coffees packaging means that it was grown on farms where there is a focus on protecting forests, rivers, soils, wildlife and farm workers. Independent studies demonstrate that farmers who use Rainforest Alliance’s sustainable methods increase yields and achieve cost savings through more efficient farm management, meaning they increase their household income. Achieving certification also helps farmers reach new markets, negotiate better prices, improve their access to credit and earn a premium on their beans that they can use to build a more economically secure future. Gloria Jean’s Coffees believes that the program created by the Rainforest Alliance serves the greatest good for the most people; both on an individual and community-wide level and that the organization supports a wide geographical area, especially when compared to other certification programs. We’re proud to help conserve the environment and improve the lives of the many coffee producers and others whose well-being depends on the coffee industry. 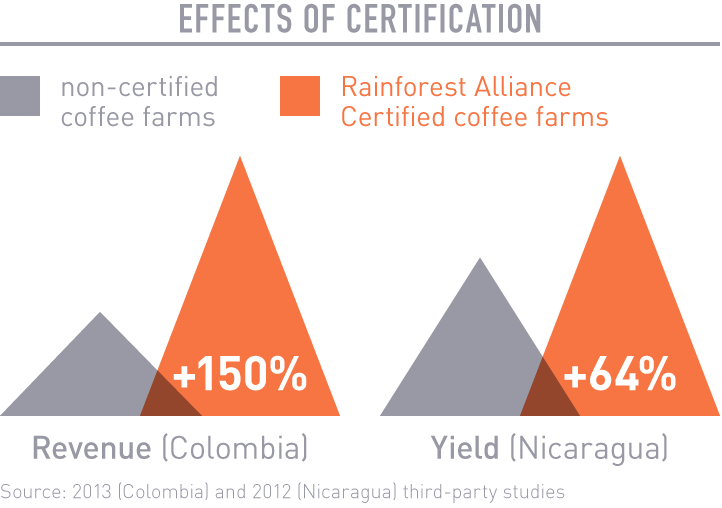 To learn more about the Rainforest Alliance’s work in coffee, visit: www.rainforest-alliance.org/coffee.